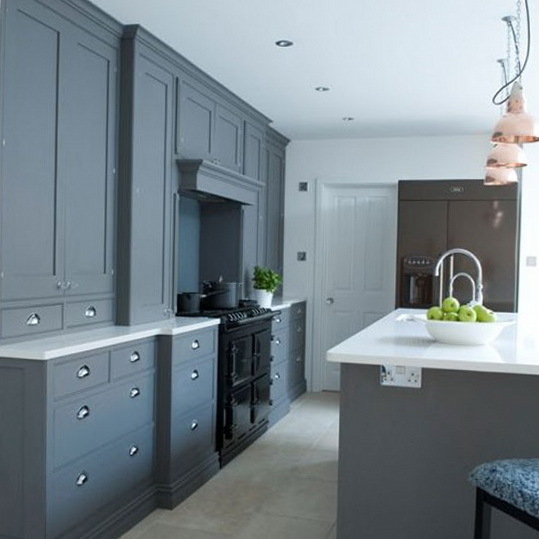 Divide a large kitchen into cooking and dining areas with a practical island unit. Fit folding glass doors to maximise the light and lay flagstone flooring or lookalike tiles in varying sizes for rustic, country appeal. 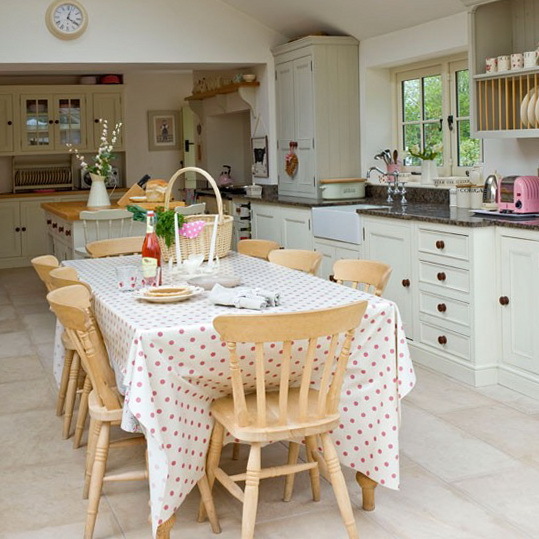 Cream kitchen units with shaker-style panelled doors and dark wood bun handles are ideal for the country look. 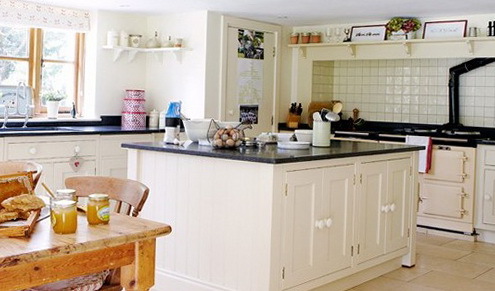 Opt for granite worktops as a contrast to the cabinets and bring in a farmhouse table and chairs for relaxed meals. 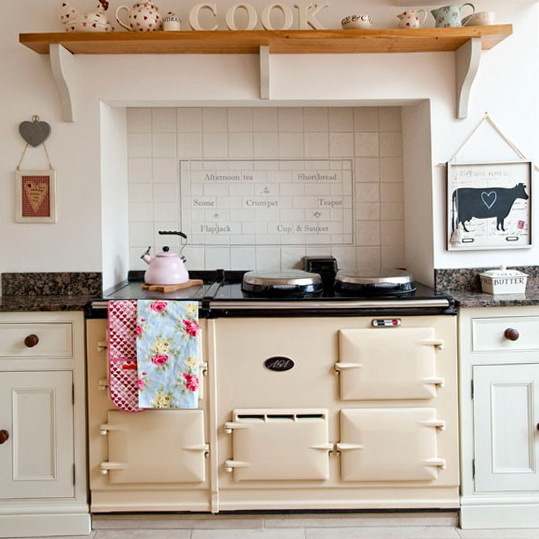 Set a classic cream Aga into a chimney breast with a mantel shelf above to create the quintessential country kitchen. 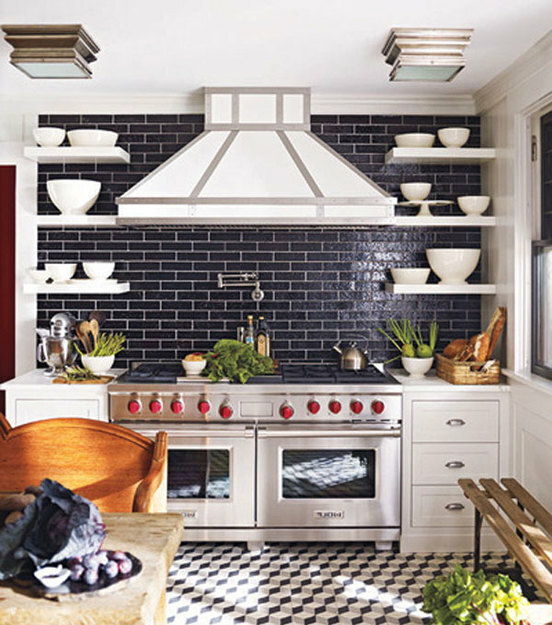 A panel of decorative tiles printed with foodie words adds to the effect. A curvy island unit supplies valuable workspace and extends to form a glass-topped breakfast bar, providing this kitchen with the wow factor. 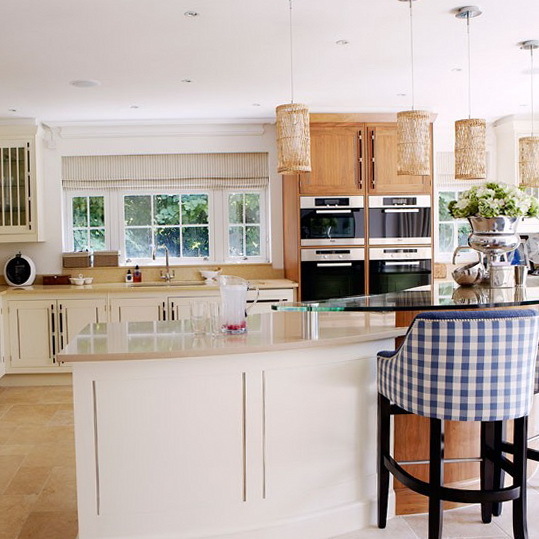 Contrast cream units with a bank of gleaming built-in ovens. Pale blue units with contemporary bar handles could look a shade too cool, but a reclaimed teak table and wood flooring provide a warm tone. 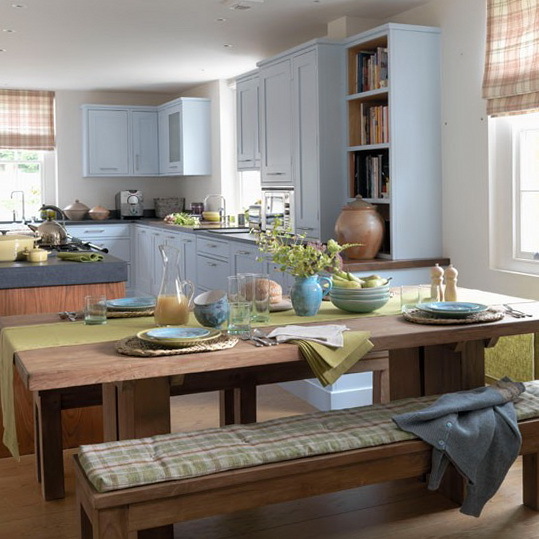 Accessorise in blue and lime, and bring in a check blind and cushion to draw the scheme together. 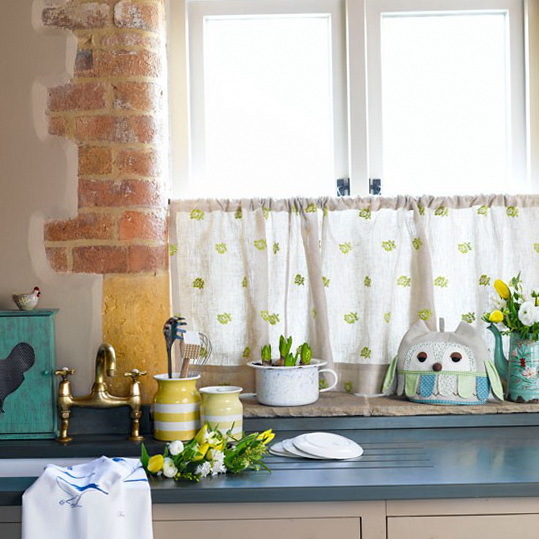 Hang a café curtain in pretty embroidered linen part-way up the window. Make up a lightweight curtain with a deep hem at the top and slide onto an expanding tension rod for an instant fit, no screws required. 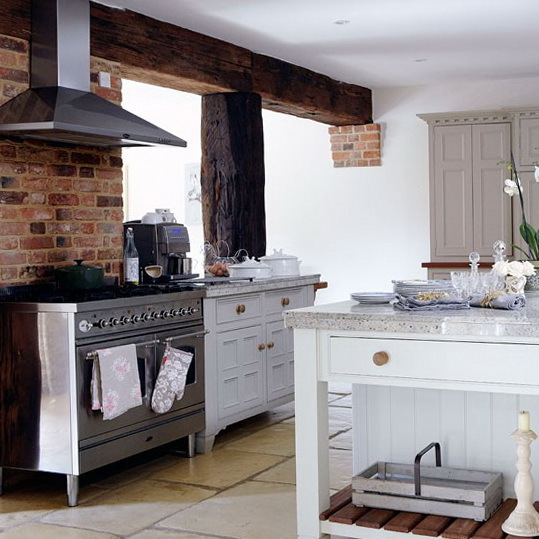 Old beams and an exposed brick wall are a great backdrop for a modern range cooker and extractor hood in gleaming steel. Units are painted in crisp white, with marble effect worktops adding a classic touch. 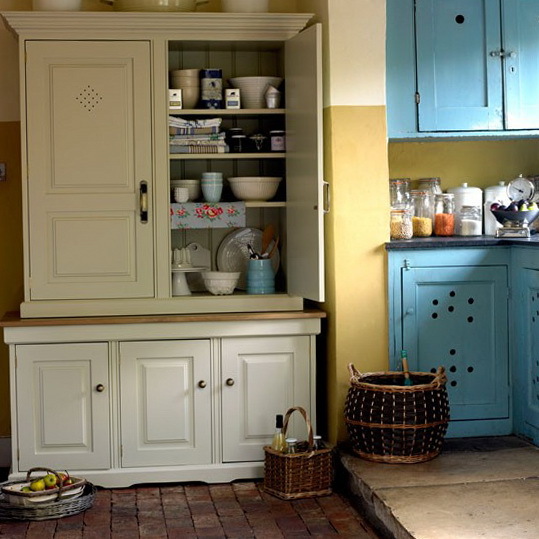 Expand your kitchen storage with a practical larder cupboard. Behind the doors practical shelves deal with a multitude of baking utensils and tinned or dried goods. 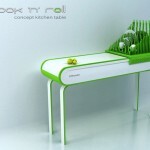 If you have plates to display opt for an open top. 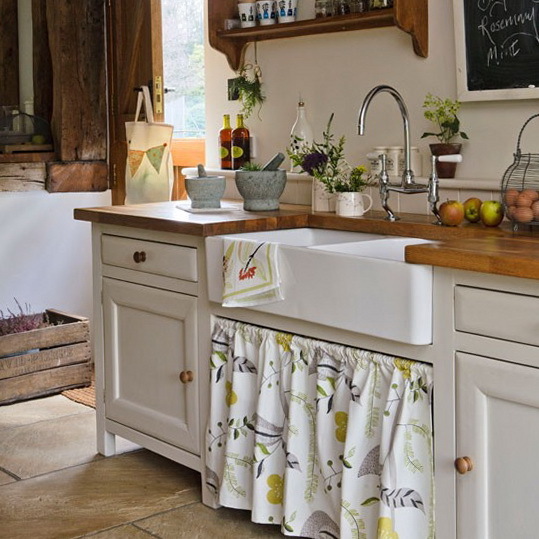 Turn the sink area into a focal point with a double butler’s sink fitted with a traditional bridge tap with ceramic handles. 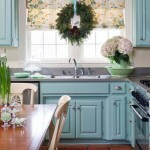 Stitch an under-sink curtain from pretty, summery fabric to hide away clutter. 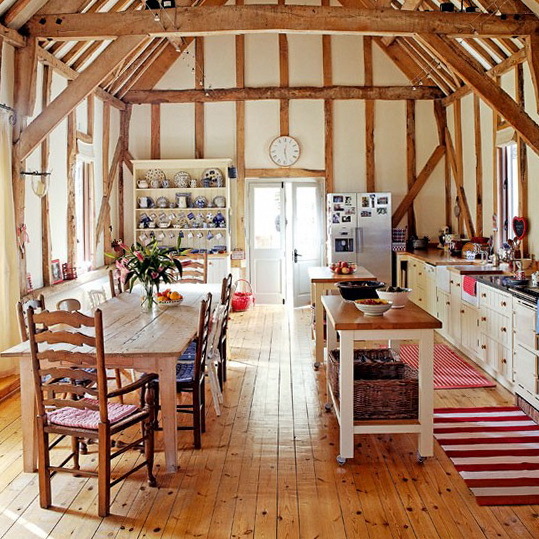 In a spacious kitchen located in a barn the mix and match approach works well. 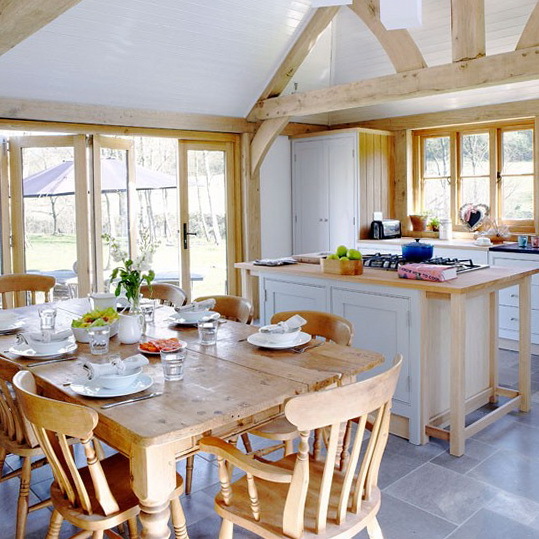 Fit cream tongue and groove units, then emphasise the wood floor and beams with a well-scrubbed farmhouse table and assorted chairs.